Part of the reported "sun-faded" vintage collection, Urban Outfitter's controversial sweater appeared to be blood-splattered. Earlier this season the clothing store Urban Outfitters displayed an apparently bloody sweatshirt with the words “Kent State University” written along it with the school’s logo. To say this shirt resulted in a major backlash from the university’s community is an understatement. As many know, the KSU community was changed forever on May 4, 1970, when members of the National Guard killed four students and injured others who were protesting the Vietnam War, specifically the Cambodian Campaign. This event has since haunted the campus; thus the feelings that arose when the shirt was placed on sale were negative, to say the least. This is not the first time that the company has marketed and sold a product negatively affiliated with a group or event. A few years ago the company produced a shirt that was golden yellow and depicted a star on the front pocket that had a similar depiction as the Star of David. Many people said the shirt channeled the public humiliation Jews had to undergo in Europe during The Holocaust. Casey Newmeyer, a marketing professor at Case Western Reserve University’s Weatherhead School of Management, verified that the event involving Kent State was not the first time Urban Outfitters offended a group of people. “If they continue to do so, there will be long-term implications,” said Newmeyer. Although companies may intentionally or unintentionally market offensive designs, most of them issue apologies for having offended the public. 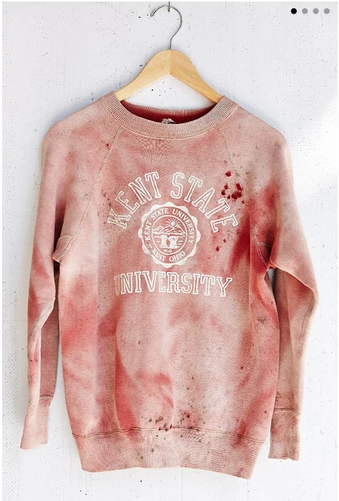 In the recent case of the bloody Kent State University shirt, Urban Outfitters released an apology, but denied any intent of negative perception. Instead Matthews says the company claimed its design was not inspired to reflect upon May 4, but instead the design was styled as “sun-bleached.” However, with an end result of appearing blood-splattered, Urban Outfitters is having a difficult time with the explanation. The negative association with the shirt has caused not only the community of KSU to have tension with Urban Outfitters, but since the event went viral throughout the internet, the damaging press has associated a negative image with the company throughout many geographically different markets. As a campus that has also experienced a school shooting and is situated in an area where police reports are a relative social norm, the sensitivity about this issue is ever present around CWRU. While the fashion industry might like to push boundaries for the sake of being edgy, there is a point when edgy crosses over into being offensive; that is, exactly what Urban Outfitters has done with its one-of-a-kind sweatshirt.